My son spent the last weekend in Scotland and he has apparently bought back some traditional Scottish shortbread, but I will have to wait until I see him next to know what they taste like. The emblem of Scotland is the thistle and if you go here you can read all about why this is so. 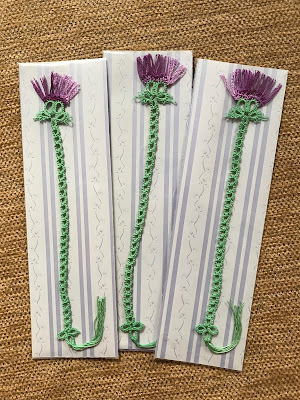 I had a request to make three thistle bookmarks and they are now finished and ready to post. The pattern is on the side of my blog, the only difference is that now I split the threads on the top to make them look more like the flower on the thistle. Still struggling with the green doily which I hope to show you on the next post. Sally these bookmarks are brilliant. Definitely on my to do list. I've always admired your thistle pattern, and I especially like the split-rings for the tassels here. They really set off the design, and would lie flat in a book. Nicely packaged, too! Tatted lace is so versatile! 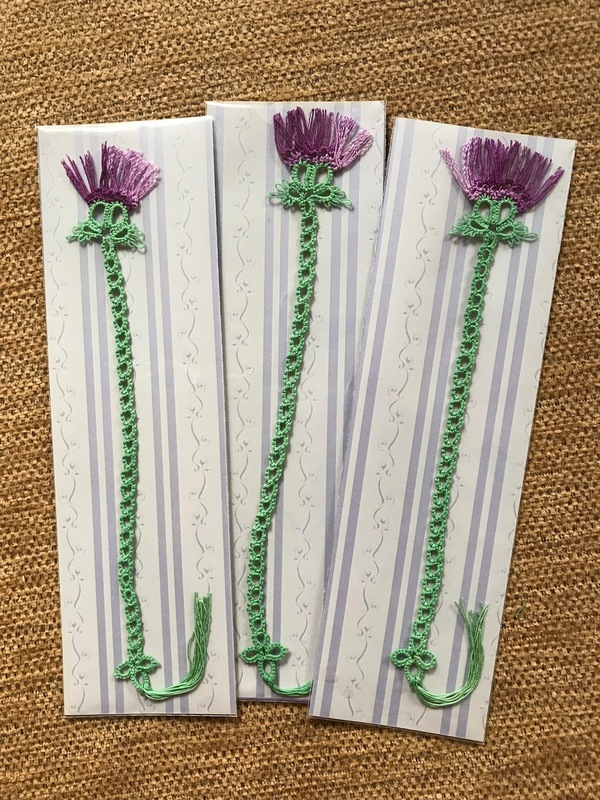 I love your thistle bookmarks! I have to make at least one for myself now. Well, maybe more. Too many books. Wonderful markers.